It is with sincere regret that I inform you of the death of Lt. Col ALLEN. He died this morning at 3 o—™clock, of congestive fever, after an illness of ten days, in his 38th year of age. He, you know, was Capt. of 1st Dragoons, and was deputed by Gen KEARNEY [sic], to muster into service of the United States, the Mormons as Infantry. Of this battalion, he was elected Lt. Colonel. He has endured great fatigue, and hardships, since his election, and his constitution, which was much impaired before, was unable to endure so much. His death has thrown a gloom over every thing at the Fort to day, and every face indicates sincere distress. I understand that he was a noble soldier, and, universally beloved by all who knew him. His battalion (which has been gone ten days) perfectly idolized him, and his death will be a severe blow to them. He was much attached to the soldiers in his command, had brought them under very superior discipline, and said before his death, that he had never commanded a finer, or more orderly company. Indeed every one here (ladies too) speak highly of this battalion. Lieutenant Colonel ALLEN was without a family but he did not go to the tomb unwept. When he was a young lieutenant, a dying mother, who knew him, and appreciated to the kindness of his nature, placed under his charge, a little orphan daughter. This child he took, and rearing with all the tender affection of fond father, adopted her as his own, and gave her a fine education. She is now grown, the wife of one of the officers at this station. At her house her died, and from her he received the most constant and affectionate attention during his illness. His death deeply distressed her. His faithful servant, Levi Wells, to whom he was much attached, and who has lived with him for years, hung over his body, and wrung his hands in an agony of grief. He was buried this afternoon, at five o—™clock, with military honors, by company A of the first Infantry, Lt. Wm E. Prince commanding. This company made a fine appearance on parade. The flag of the United States was folded and laid over his coffin, which was proceeded to the grave by the company of Lieut. Prince and, one of the finest bands of music I have ever heard, belonging to the first regiment of dragoons. Capt. HOLT, Lieut. SMITH, Dr. SANDERSON, and Lieut BUCHANAN acted as his pallbearers. His body was conducted to a high bluff overlooking the broad Missouri , whose waters lave its base, and thence deposited forever. In the procession immediately following his body, was his beautifully spotted horse, led by his servant, Wells, caparisoned as if for battle. His boots and spurs were at the stirrups, his sword hanging at the side of the horse, and his pistols, bare and of dazzling brightness, hanging at, the pommel of the saddle. Lieutenant Colonel Allen is the first officer who has died at Fort Leavenworth since its establishment, a period of nineteen years. This is a remarkable fact. Born O JAMES ALLEN Ap’d Indiana, Military History Cadet at the Military Academy, July 1 1825, to July 1 1829, when he was graduated and promoted in the Army to BVT SECOND LIEUT 5TH INFANTRY JULY 1 1829; SECOND LIEUT 5TH INFANTRY, JULY 1 1829. Served on frontier duty at Ft Brady, Michigan, 1829-33. SECOND LIEUT IST DRAGOONS, MAR. 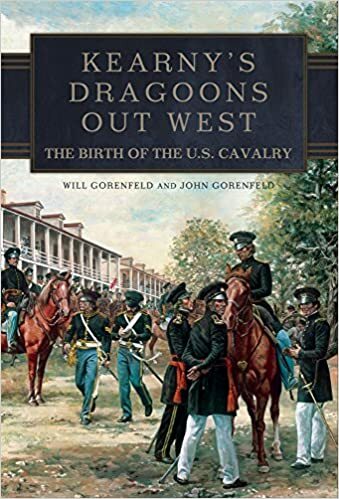 4 1833, Dearborn, Ill., 1833-34, on Engineer duty Jan 10, 1834, to Oct 15; FIRST LIEUT IST DRAGOONS, MAY 31, 1835-1836, on frontier duty at Ft Leavenworth, Kan., 1837. CAPTAIN, IST DRAGOONS, JUNE 30. 1837. Frontier duty at Ft Leavenworth, 1839-42; Ft Gibson IT 1842; March to Ft Atkinson Io. 1842; Ft Sandford, Io 1842 Raccoon Fork, Io. 1843; Ft Des Moines, Io. 1843-44; Raccoon Fork, Io., 1844; Ft Des Moines, Io., 1844-45; Expedition to Lac Qui Parle 1845 and Ft Des Moines, Io. 1845-46 and in the War with Mexico, 1846 as Lient. Colonel commanding Mormon Battalion of Missouri Volunteers on the march to New Mexico July 16 to Aug 23 1846. DIED AUG 23 1846 AT FT LEAVENWORTH, KAN AGED 40. James Allen was a member of the orginal cast of 1sr Dragoons. Like so many others in the army, he had a serious addition to spirits. The rigors of hard duty on the prairies served to further weakened his body. Many thanks to Tim Kimball for unearthing this obituary. George Evans graduated from the Military Academy as a member of the legendary Class of in 1846. Assigned as a brevet 2d Lieutenant to the 1st Dragoons, he received a brevet for bravery at the battle of Buene Vista before receiving his permanent rank of 2d Lt. Assigned to A Company, he suffered what appears to be a stroke while in California in 1850. Sent home to Maine, he languished for another 9 years before dying on 29 March 1859. Report of the Adjutant General of the Army relates to passing over 2d Lieutenant George F. Evans, of the 1st Regiment of Dragoons, on account of physical disability. Sir: Lieutenant George F. Evans, of the 1st Dragoons, being at the head of the list of second lieutenants of his regiment, and a vacancy having occurred therein by the resignation of Captain Buford, I respectfully request your instructions on the question of carrying up Lieutenant Evans to a first lieutenancy, or giving the promotion to the next below him on the regimental list. Lieutenant Evans left his company in California in October, 1850, in consequence of a severe attack of paralysis, affecting both his limbs and speech, and from which there seems but little, if any, prospect of his recovery. He is entirely unable to make the monthly sick-reports prescribed by the regulations, which are in the handwriting of his father, Lieutenant E., simply affixing his mark to them. Accompanying is the last certificate of Lieutenant Evans’s physicians, dated at Gardiner, Maine, October 2, 1854. The disability of Lieutenant Evans requires that the officer next below him, competent for active service, shall be promoted over him. So we’ll sing our reminiscences of Benny Havens, Oh! Oh! Benny havens, Oh! Oh! Benny Havens, Oh! We—™ll sing our reminiscences of Benny Havens, Oh! The song soon became quite popular among officers. During the ensuing years, many a new verse was added as cadets carried the song with them from the dismal Everglades to Buena Vista’s barren plain and then out to the foothills of California’s Motherlode. Thomas Foster Castor entered West Point in 1841. His classmates, a rather notable group, included the likes of George McClelland, Thomas Jackson, A.P. Hill, George Crook and George Pickett. The latter cadet seems to have become addicted to Benny’s enticements. During the years of Cadet Castor’s stay at the Academy it is likely that he also frequently slipped out of the barracks to partake in a glass of hard cider and join in the good cheer at Benny Haven’s public house. They’re oft remembered in our cups at Benny Havens, Oh! Upon graduation in 1846, Castor was posted to Fort Columbus in New York Harbor. Here is a copy of letter that a freshly minted brevet 2d Lieutenant Castor wrote to the folks back home in Pennsylvania. Well here I am snugly fixed on the Island. I arrived in N. York on Tuesday about 2 o’clock and reported myself for duty about 5 on the same day. I was attached to the dragoon recruits now here under the command of Lieut. Sibley. I have nothing to do but to superintend the drills and roll-calls, inspect their rations and keep them in order generally. I suppose that it will afford you a great deal of pleasure to hear that we will probably not sail for a month yet and very likely not that soon. Mr. Sibley told me that he would propose to the Captain when he arrived to take the company from here to Carlisle, mount it there and after drilling it for some time take it down to Mexico by land. if this obtains I would not be surprised if we did not leave this part of the country until November. And if the reports which have just been received prove true (viz. that private advices have been received that the war is over) we will very likely not go to Texas at all. Aunt Eliza I know will clap her hands at this news notwithstanding it cuts me out of all chance of distinguishing myself. I have been so lucky as to get quarters with one of my classmates who has been here for some time and we have to rooms carpeted with tables, sofa, beds, looking glasses and everything complete. To day I am Officer of the Day and it would make you laugh to see me strutting around with my sash and sabre followed all day by an orderly at a respectful distance and having Captains and old Lieuts. asking permission to have boats etc. The Officer of the Day being you know second in command for the time being. I am very well pleased with the post so much as I know of it. The officers are very clever and the society I am told is very good. I had the blues going up the river and indeed the whole day after I left home. I waved my handkerchief as I passed our house but I suppose it was so foggy you did not see it as I could see none waved in return. Please tell me in your answer how Aunt Eliza and [Bud?] got home and particularly how Josephine is. I was afraid when I left that she would have a spell of sickness. How did she get through wit her teeth, how much did they cost and every thing. you must tell me all. I hope you have gotten over your troubles on account of my departure and if you have not I say you must!! Yesterday about 700 troops sailed from here for Pt. Isabel. Poor fellows they were glad to get off but many a soldiers wife who was left behind went sorrowing to her home. If there are any letters at home for me please send them on directed to Ft. Columbus, Governors Island, N.Y. I am getting over my home sickness and am in good health. Please write very soon and tell all that has occurred since I left home, and everything that would be of any interest to me. Give my love to Aunts Liz and Buts [?] and take it yourself. I am going to write to all in succession? as I promised and I hope that nobody will fail to write me a long long answer. You dear grandmother must get Buts [?] to write for you. It is near 11 o’clock so good night dear Grandmother and I hope that you will not forget. On 6 December 1846, Castor gained a permanent commission as 2d Lt. with the 1st Dragoons and campaigned in Mexico with the regiment, from the siege of Vera Cruz into the Valley of Mexico through the capture of Mexico City. While in Mexico he became quite ill and began to drink heavily. There may not have been much sobriety, but promotion came slow: Castor did not become a First Lieutenant until 1851. Following the war Castor was posted to Forts Snelling and Ripley, Minnesota. On 9 October 1851. While stationed at Fort Lane in Oregon he participated in a skirmish on the Illinois River on 24 October 1853. The next year Lt. Castor was sent to Fort Miller in California with Company A. Later that year he was ordered to start construction on what became Fort Tejon. Castor’s drinking and ill health continued to rack his body. In August of 1854, Castor led the first troops to the proposed site of Fort Tejon. The rigors of years of hard campaigning, and the effects of hard drinking, had taken their toll on the Lieutenant. Castor had a bout with tuberculosis and was seriously ill during his posting at Fort Tejon. On September 8, 1855, he died. We’ll never fail to drink to her and Benny Havens, Oh! His remains were ceremoniously buried under the spreading oaks that dot the landscape behind the Lebeck Oak. Fellow officers bought a marble headstone and an iron fence to honor their fallen comrade. Castor’s relatives back east had his body moved there to a final resting place. They poured their life-blood freely our pro bono publico. They lie neglected far away from Benny Havens, Oh! Thompson grew up in a privileged family, the eldest son of Dr. B.C. Thompson of Augusta, Georgia and grandson of Philip R. Thompson, a former congressman from western Virginia. Thompson had attended the Richmond Academy and then was a cadet at the United States Military Academy. In 1835, he graduated 36th in a class of 56 from the Military Academy, and the Army assigned him to the 1st Dragoons. The years 1837-1841, found Thompson serving on the plains at Forts Atkinson and Leavenworth as well as the regimental adjutant for Col. Stephen W. Kearny. 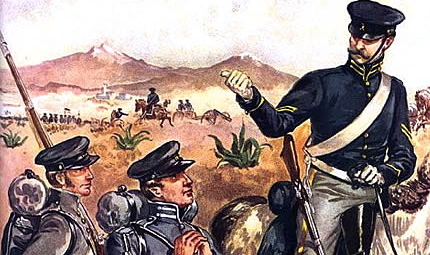 In 1846, with the outset of the Mexican-American War, the Army promoted Thompson to the rank of Captain. Alcoholism was a serious problem for far too many an officer in the antebellum army. Thompson was fighting a lifelong battle with alcohol and it was a battle that he would ultimately lose. At war’s end, Capt. Thompson reunited with his dragoon company at Ft. Scott, Missouri Territory. In the spring of 1851, the troop traveled to New Mexico Territory. Katie Bowen, the wife of Captain Isaac Bowen, department commissary officer, 1851-1855, traveled with the column. She wrote of Capt. Thompson, when intoxicated, could turn violent. “Frequently he has had ‘the man with the poker’ after him and always carries his pistols loaded. He fancies, when in his cups that some of his men are going to kill him, and last night, as this man was cooking by the fire, the Maj called him and presented a pistol to his head, but immediately lowered it and told the man to go about his work. When, as he was stooping over the fire, the Maj deliberately shot him in the back, the ball passing through the body under and into one arm. Medical aid from here was soon procured and the man is still alive but little hopes of recovery. Maj Thompson has been arrested . . . . He is very polished and agreeable when himself, but can not live long at the rate he has drank while here. He has nights of delirium . . . but is always gentle with his wife. She, poor soul, must be in trouble enough now. I have not heard how she bears it.” The man whom Thompson shot survived, and the Army ordered Thompson to pay him $600 in damages and required that he join the temperance society in Santa Fe. Thompson “broke the pledge so soon that the society expelled him.” Maj. Blake, like many other commanding officers out West, was short of officers and put up with Thompson—™s alcoholism. He would pledge anew to Maj. Blake to stop drinking and again would fall off the wagon. Showing up intoxicated and disrespectful at an army court martial in Taos in 1855 would result in Thompson being cashiered out of the army. This talented officer was quickly recruited by filisbustero William Walker to serve as his adjutant during the abortive expedition to Nicaragua. Thompson’s ever-loyal wife accompanied him on this expedition. On 1 May, 1857, following the battle of Rivas, Walker’s entire force surrendered to Commander C.H. Davis of the U.S. Navy, and boarded ships taking them back to the United States. One account has Capt. Thompson dying of dysentery while aboard the steam frigate USS WABASH on 24 June 1857, and being buried at sea. His wife later wrote that he landed in New Orleans and died soon afterwards. a fair number of officers fought with the federals initially, then went over. ole pete longstreet, as he resigned his commision as a paymaster major and hoped to become the paymaster general of the confederacy, offered to make good any unpaid salaries and compensation that might cause reluctant rebels to hang fire. i dont know of any actual results– it doesnt seem that pete had any authority to do so when he did it as he was leaving new mexico after his own resignation. i do suspect that some resingation were only made after compensation was caught up.